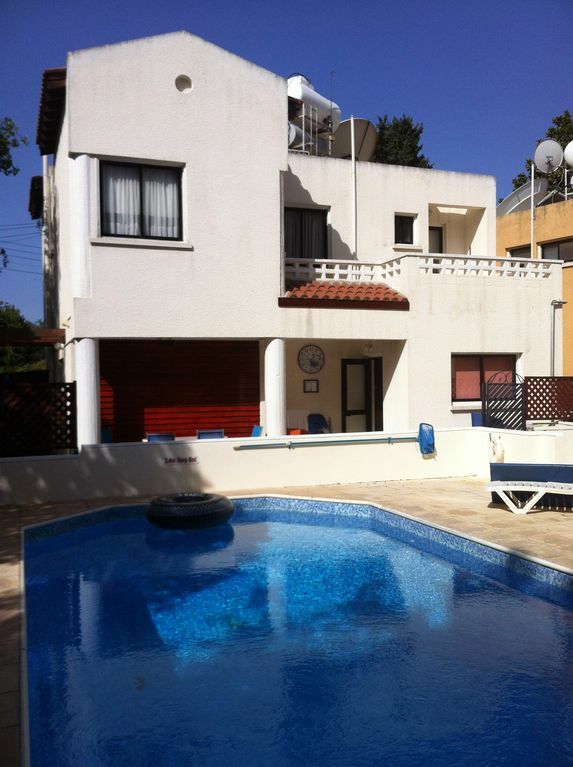 luxury 3 bed 2 bath villa situated in a private small complex in a key location in Kato Paphos. The shared pool is over-looked by the villa. All bedrooms are air-conditioned (The price quoted is for upto 7 people, the villa can accomodate upto 9 people using a 4th bedroom which is made available upon request for an additional 15% charge). The accommodation consists of master bedroom (en-suite) with access to balconies front and rear, 2 large double bedrooms with balconies, there is a 4th double bedroom on the ground floor, large lounge, dining room and fully fitted kitchen. Included in the price..... Air Conditioning andThe Internet allowance is Unlimited (speed upto 10mbps), with WiFi connection, surf the web, play games on your Ipad or watch UK TV on your laptop (using the TV in the lounge is also connected to the internet so you are able to watch your usual programes. Since Sky stopped transmitting a signal to the island UK Freeview channels can only be viewed in Cyprus via the internet. The property is just a short walk to restaurants, bars, shops and the sea. The complex consists of just 4 villas. The location is very quite and yet is only 800 yards from the main tourist area and near the main bus routes hire car optional. Villa Nerina has been privately owned by the present owners for 14 years. It has been improved year on year and furnished for the use of the owners, as well as guests. The property is elegant and modern, it is situated in a quite residential area of Kato Paphos, ensuring a unique opportunity for quality relaxing holidays. It is very large which gives the opportunity for larger families to maintain space and therefore maintain a relaxed holiday environment. We realise your on holiday and no one wants to wash up but the outdoor cooking area can be of huge benefit. Obviously there is the BBQ, but also the Kileftiko oven is an old fashioned slow cooker. Get yourself a joint of meat, wrap in foil, throw it in. Now go and enjoy your sun bathing for 2 hours, return to it and throw in some potatoes wraped in foil and leave for another 2 hours. The meat will fall off the bone and the jackets will be soft and fluffy, serve with salad and a glass of local wine. Jamie Oliver would love it and so will you!!!! You can find the exact location of our villa in Google Maps or Google Earth and typing the words 'Nestoros, Paphos, Cyprus, The villa's name is 'Villa Nerina'. You can view videos of the villa on YouTube, just enter "Villa Nerina 2018". A taxi from the airport will cost approximately 30 euros alternatively a bus service runs every hour for 1.5 euro per person and is located immediately outside the arrivals hall. The bus stop is located at Alexander the Great Hotel, which is 300 metres away from the villa. For larger 2 bed villa next door is also advertised on this site (property number 447106). We purchased the villa in 2000. We chose this property due to it's location to all facilities, size, quiet location and the fact that the communal pool is shared by only 3 other small properties. It provides ample room for large families. There is a Playstation 3 connected to the TV, this allows the use of games, plus the advantage of being able to use it as a DVD and Blue-ray player. The Nile Sat system has sports, news and film channels. Since Sky stopped transmitting a signal to Cyprus you can only watch UK TV via the internet (we use www.filmon.com). The internet connection installed is provided by CYTA (Cyprus's version of BT) via the Phone Line providing speeds upto 10mbps which offers TV viewing. It is not one of the slower Fixed Wireless connections offered at many tourist apartments but this does not guarantee Lag Free viewing. With our wireless router you can connect as many computers as you want (obviously this has the usual security protection). We thoroughly enjoyed our four week stay. The villa is close to all the sights and amenities. Highly recommend the villa for convenience to all of Kato Paphos. The owners and their rep in Paphos were extremely helpful and dealt promptly with an internet issue. Sofa was quite damaged and definitely in need of renewing! We are disappointed with this review particulary as we had various telephone conversations leading upto the holiday and following the arrival and the only thing that was mentioned was the Pool. Unfortunately we are unable to stop cockroaches and other animals roaming into the villa in countries like Cyprus they are quite common,but this is the first time we have been made aware of it. In respect of the Pool. This was caused by the Pool Company having to change the cylica just before arrival and i advised Emma of this before arrival. As for the Settee, again this is the first i have been inform of this and will investigate as we believe its condition was fine before the arrival. As for the TV,again the first time this has been mentioned, but the instructions are clearly shown in the Villa manual and this issue has not been mentioned by anyone else. Why wait until your return to mention these issues. Great location everything needed within walking distance. The villa was ideal for our party size.Barby was great we bought some additional tools which was needed as there was none provided.Overall impression we had a great time and although there were families staying in the other villas there was enough room. Fantastic holiday in Paphos , loads to see and do !! Villa was a perfect base for our party of 8 , ranging from my 5 year old daughter to 76 year old father 4 x Teenage kids my wife and myself . Downstairs bedroom ideal for my dad , open plan downstairs , lots of veranda and outdoor space , great outdoor cooking area and great location for walking into harbour and bars , shop at end of street for necessities , easy access to main road system to explore the island via Jeep/car , water park , Adonis Baths , Tomb of kings , Lara beach all good fun days out , Coral beach for bathing and sea was spot on. Stayed here recently for 6 weeks, villa was very comfortable, with plenty of room, decent size TV with all the UK channels much appreciated when staying for a long period. Villa situated In an area just a short walk down to the restaurants and bars, turning right at the top of road takes you to the English pub, great value breakfast and a decent cup of tea..I did have a hire car for length of stay but as its so near main area its not really nessasary. This is a very good value villa with lots of room for large families..
Paphos is located on the south west coast of the island with many impressive archaeological sites. A short distance away are the mountain regions. Just a short drive away there are three very good golf courses. Paphos and the surrounding area offers something for all the family whether you are aged 9 or 99. The villa is located 300 metres inland from the Annebelle Hotel. Golf: Within a 15 minute drive there are three championship golf courses, the facilities on course are excellent. Services include buggy or electric trolley hire, club hire, tuition etc. Juniors are also strongly encouraged. A refundable bond of £150 is required. Any booking of less than 10 nights is subject to a surcharge of £50.00 A 15% charge is made for use of the 4th bedroom. The price quoted includes bedding, towels (not beach towels), air conditioning, unlimited internet & All fixed service charges.